How Far Will You Go for Spa and Scenery? 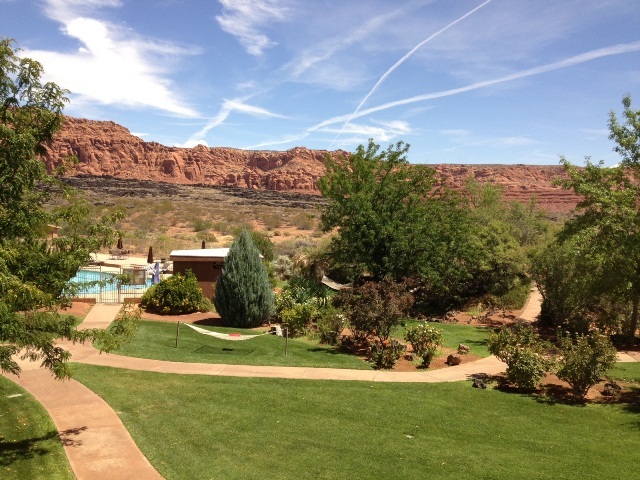 Six hours from LA, or two from Vegas, if you choose to fly, you’ll find Red Mountain Spa in Ivins, Utah, on the cusp of Zion National Park. And it’s worth going the distance – a great package of exercise classes, adventure experiences, fine dining, and heavenly spa treatments, all wrapped up inside spectacular views. You won’t find anything close to this complete resort closer to home. So pack up the cooler and gas up, or look for those bargain Las Vegas fares, and get ready for the mountain. Those clear blue Utah skies, stunning red rock cliffs, puffy white clouds, dramatic lightening streaked late afternoon thunderstorms – the resort can’t actually claim responsibility for them, but they did choose to build a resort here. The setting is truly wonderful, whether you’re lying in a hammock contemplating Red Mountain, taking a meditation class beneath a gazebo while rain falls just outside, or watching the sunrise, readying for an early morning hike. And the spa? Situated inside a geodesic dome which outwardly speaks to the spa’s health/diet resort past, inside Sagestone Spa at Red Mountain, you’ll find up-to-date luxury as you lie on a comfortable lounge chair and contemplate that heavenly view through a huge glass window, drink tea, don a cushy brown plush robe, and get ready for some fabulous treatments. Try the Happy Trails – an approximately 90 minute combination of body scrub and massage by gifted staff members, and emerge with baby-soft skin, relaxed muscles, and a sense of supreme renewal. A wide ranging menu of classes are part of the overall resort package, giving you plenty to do or not do, if you’d prefer to relax by the pool all day. Classes change daily, allowing visitors to pick anything and everything from stretching and yoga to the current hot new body realignment exercises known as Melt. Based on a best selling book, Melt uses rollers and balls to get your body feeling fit and right, and eliminate muscle aches and chronic pain. Even better: daily early morning guided hikes, also included in your stay. There are options ranging from relatively easy Explorer level to the more challenging Challenger level. Or, if following a riverside trail studded with petroglyphs isn’t your thing, there’s a Puppy Pound hike. Guests are driven to Ivins Animal Shelter and Adoption Center, a local no-kill municipal shelter to walk happy puppies and dogs and tour the center. Looking for more adventure: Red Mountain offers optional horseback riding, rappelling, rock climbing, and National Park explorations. Three full meals are served daily, with on-the-menu breakfast items supplemented by a beautiful buffet fit for gluten free, vegan, and standard diets, all with an organic and health conscious bent. Lunch is buffet; dinner menu based. Beer, wine, and wine-based cocktails (this is Utah, where liquor licensing is restricted) are available, innovative, and refreshing indeed. Highlights: the chef’s delicious fish stew at lunch; an organic chocolate lava cake for desert at dinner. While standard rooms are on the small side, comfortable beds, southwest style, and a deep soaking tub add a luxe feel, and you’re not going to be doing much more in that room than sleeping after a full and fun day. The resort also offers spacious, beautiful villas surrounding an infinity pool, with full kitchens and plenty of room to spread out. The spa caters to both men and women, and is renowned as a destination for solo travelers to enjoy, regroup, and rest. Is it worth the journey? Oh yes, indeed. Throw your LA cares away, get into shape, explore, relax, renew – go Red Mountain! For more information on booking your trip to Red Mountain and to see all it offers, please visit http://www.redmountainresort.com.